In 1928, Alfons Mucha dedicated The Slav Epic series of paintings to the City of Prague, noting that all Prague had to do was build the pavilions where the paintings would be permanently displayed. And now, after 90 years, it looks like this spectacular piece of work will get its dignified place, within the soon to be renovated Lapidarium, part of the Holesovice Exhibition Grounds. In connection with the planned reconstruction of the Lapidarium building, which dates back to the Jubilee Provincial Exhibition of 1891, a new wing of the building will be built, ideally large enough to host such a magnificent artwork. In addition, it will provide enough space for the pictures (which are up to 6 x 8 meters in size) to be seen from a sufficient distance. 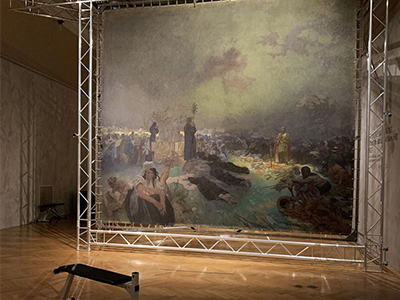 As the new and most likely fate of The Slav Epic, the Prague Mayor Adriana Krnáčová announced this intention and must be approved by the Prague Council. Both the construction and the reconstruction of the Lapidarium should be completed in two and a half years, and along side The Slav Epic, other works of Mucha should be exhibited.